A brief look at what a typical conversion kit consists of. Click on a number for more information. LOCATION: Back end. The LPG filler is permanently mounted to the vehicle around the same location as the petrol filler or fixed to the lower part of the bumper. SAFETY: LPG fill connectors feature one-way safety valves to enable safe and convenient refueling. LOCATION: Back end. There are two types of tanks Cylindrical or Donut type. The tank is fitted secured in the boot of the car. SAFETY: The tank is made of High quality steel, the thickness of its walls is from approx. 3 to 4 mm depending on the tank size, EC Approved, secured with bolts to the floor of the vehicle and steel straps. USE: Multi use. Limit the fuel entry to 80% into the tank, LPG level gauge, Deliver LPG to front end, Pressure release valve. LOCATION: Back end. Installed inside the LPG tank. SAFETY: The principal safety functions is the pressure relief valve (safety valve) and the pressure relief device (thermofuse) that in case of overpressure or fire allow the discharge of LPG from the tank, in order to avoid an explosion of the tank. The multivalve is equipped with an excess flow valve in case of accident or breakage of the outlet pipes between the tank and the engine bay this valve stops the abnormal excess outgoing flow of lpg. The multivalve is also provided with a shut-off solenoid valve that allows the lpg flow towards the engine only when the engine is running and when the lpg supply is selected by the driver. The regulation prescribes that the lpg filling shall stop when the 80% of the volume is reached; this is obtained through a 80% device controlled by a float that is moving inside the tank. The multivalve is also equipped with a manual shut of valve. The multivalve has also a non-return valves in order to prevent the back flow of lpg towards filler connection. USE: The filter removes any dirt in the gas flowing into the front end system. USE: Monitors reducer temperature, reducer pressure, injection rail gas pressure, manifold pressure, engine rpm, injection timing. Send signal to gas injectors. 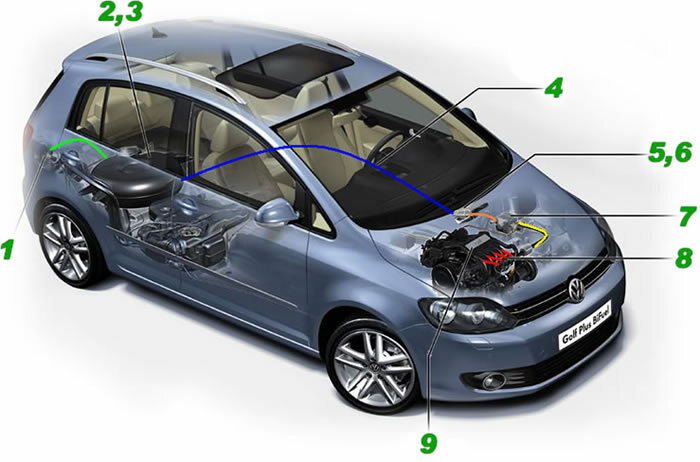 SAFETY: Switch off gas flow in case engine switches off abnormally. USE: Chamber that allow a reduction of pressure of the LPG and to convert liquefied LPG to a gas form. Deliver gas to the injectors rail. USE: Follows signals from LPG Control Module to inject the correct amount of gas at the correct timing in the correct cylinder into the engine trough the injection nozzles. SAFETY: Continually monitors gas pressure in the rail. USE: Inject gas into engine inlet manifold. LOCATION: Front end. Engine compartment. Screwed into engine inlet manifold. Harness connection between LPG Control Module and LPG Injectors rail. Harness connection between LPG Control Module and Petrol Injectors.